Huzzah, a serious Creationist kids’ book to review! The book is a nice sized hardcover with fun illustrations decorating it. Even better, every page inside has similar drawings to hold your interest as well. I was a little worried when reading the vocabulary in the preface that the whole thing would go over kids’ heads. That didn’t end up being a problem at all. The writing does have a tendency to slip into school textbook style, except when the authors remembered it was supposed to be about Mr. Hibb, but it’s always a quality textbook! I’ve been rather hogging the book for myself until writing this, but have no doubt my 10 year old can handle this on her own. An 8 year old who likes geology and can read well is going to have no problem either. The best part is all the pictures. They match what’s being talked about in the text and are really well done. Even my 3 year old wants me to snuggle with him and look at Mr. Hibb and his crazy adventures! 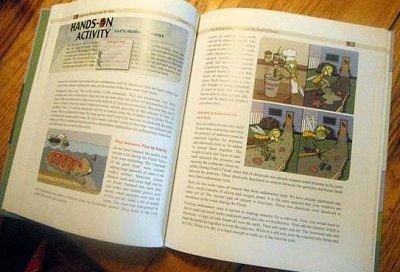 Besides the illustrations, the best feature of this book is the Hands On Activities. A dozen times throughout, there are simple things for kids to do picturing what they’re learning or even recreating a process. Since I like to keep my hands clean, I just read about them, but next Summer I’ll hand the book to the kids to do them for themselves! There’s a fair amount of worldview thrown into the book. It’s not designed for teens and adults, rather more than less presuming the Bible is completely trustworthy. But, there are whole books written about those topics for later. That last section is particularly well done since Michael Oard is the author. He’s spent vast quantities of time studying the Ice Age and written other books on it. His viewpoint comes through quite strongly and this book makes a great case for him. Altogether, I’m putting this at the top of my “suggested resources” list. Geology is the strongest area the Evolutionist and Uniformitarian has. Even Bible believers who understand the problems with Evolution are often deceived by the case geologists make for slow, gradual changes in the rocks. This book gets things down to a 10 year old’s level clearly and attractively. In fact, any person who doesn’t feel silly having the main character be a four-legged grasshopper (picky, picky, I know) is going to learn a lot from this book. I’d heard a tiny bit about sea mounts and water gaps before this. The book lets you “see” how things can happen. Oh, yes, part of why I’d not handed the book over to my kids yet is I need to get out some tape to reattach the glossary at the back. The book is published by Creation Book Publishers and whatever stitching machine they used let a whole section fall out.